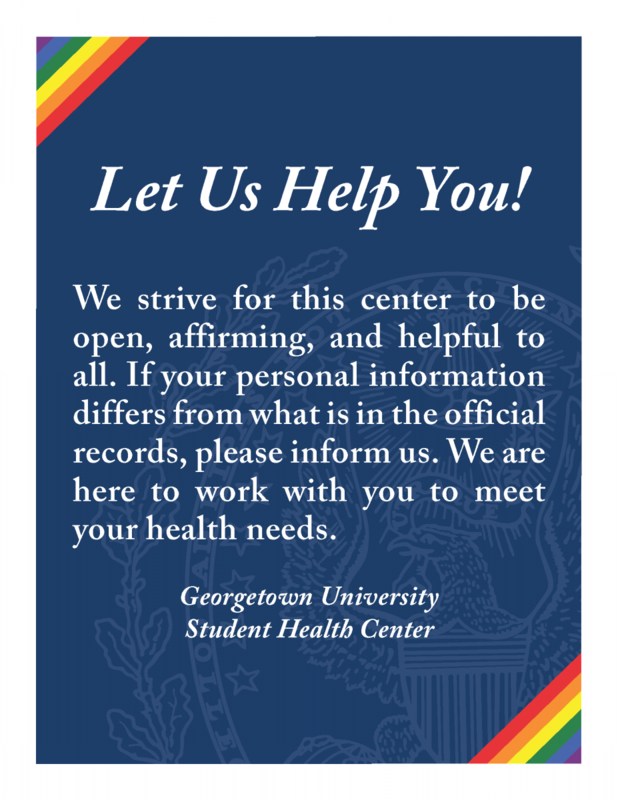 At the Student Health Center, we believe you should develop personal responsibility for your health during your years at Georgetown University. Staying healthy will help you maximize your educational experience and thrive while at Georgetown. Note: We are between Epicurean Restaurant and St. Mary’s Hall on the ground floor of Darnall Hall. Look for our blue awning. Main Campus Construction Notification: Pedestrian access to the Student Health Center has been changing due to MedStar construction, however, regular and handicap access will be maintained. Please allow extra time prior to your appointment. If you have questions regarding access please call 202-687-2200 and choose Option #1. Construction Parking and Directions: Patients and visitors must enter the Hospital campus via Entrance 2 off Reservoir Road. Enter the parking garage to your left and your car will be valet parked at no additional charge. Entrance 1 will be closed due to construction of our new Medical/Surgical Pavilion. Click here for Construction Parking and Directions details. NOTE: The GU School of Continuing Studies (SCS) students seeking medical care should visit the MedStar Georgetown Student Health Center, located at 3800 Reservoir Road, NW, (main campus), Ground Floor, Darnall Hall, adjacent to St Mary’s Hall and Epicurean Restaurant. More information on how to get to the main campus clinic can be found by viewing the law center to main campus GUTS shuttle schedule and Transportation website. The Student Health’s Center’s law school campus blood drawing hours are the same as the clinic’s business hours. You must arrive 30 minutes prior to closing to ensure that you will be seen for laboratory services. Quantiferon/TB Testing is not available at this location. Our mission is to provide high-quality, accessible and inclusive health care to the students at Georgetown University in the Jesuit tradition of cura personalis. The student health center offers the full spectrum of primary care including on-site labs to Georgetown students with the mission of supporting health while in a rigorous academic environment. We do preventive care including physicals, well women, STI screening and pre-travel visits. We handle urgent needs such as infections, injuries, and more complex problems with same day appointments. We also manage chronic illnesses and provide prescription refills. We ensure compliance with immunization requirements and provide about 5,000 free flu vaccines yearly. A full description of each service is available on our services page. We have over 30 employees and 2 clinic locations – main campus and law campus. We are owned and operated by MedStar Health. We are a Department of the MedStar Georgetown University Hospital, and accordingly, our physicians, nurse practitioners and staff abide by the Ethical and Religious Directives for Catholic Health Care Services, (Fifth Edition – 2009). We close only on hospital holidays and remain open during University breaks. We also respond to population health crises when they occur on campus (such as influenza, norovirus, or meningitis). We look forward to serving you! Request appointments, renew prescriptions, and request or view lab and test results online! Enroll with My MedStar Connect today. If you’re an incoming student, obtain your immunization and tuberculosis screening certificate.